We cannot contain our excitement over this progressive architectural trend: Shipping containers - yes, the same rectangular structures you see piled high on cargo ships and in ports around the world - are being recycled. And we don't mean sent to the scrap yard; these structures are being recycled into homes, office buildings, retail spaces, and even traveling museum exhibits. These days, you'll find examples of this sensible architectural style popping up around Colorado. Since the trend first made its appearance in 2010, the architectural use of shipping containers doubled within the first year, and its popularity has been on an upward trajectory ever since. Dubbed "cargotecture" by Seattle architect Joel Egan, this movement is fueled by economical sensibility, environmentalism, and style. 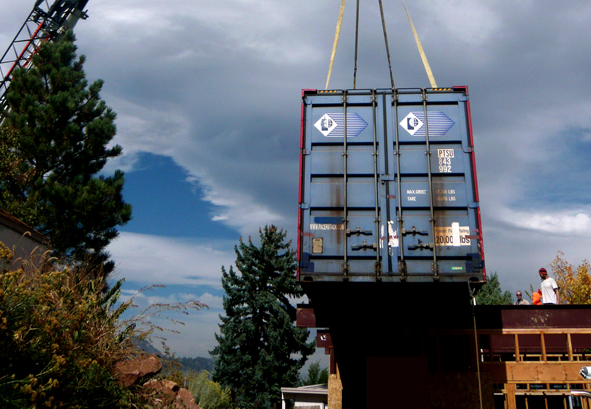 With construction costs on the rise, empty shipping containers are an economical no-brainer. Fetching anywhere from $2,800 to $4,800 depending on size and availability (most range from 20 to 40 feet long), simple architectural designs can be completed for as little as $95 per square foot—not a bad price for a custom build. Constructed from heavy-gauge steel, shipping containers are designed to withstand the elements (even without paint), making them a versatile, nearly indestructible building material. And one that's perfect for Colorado's intense weather and sun: the flat-topped containers also pair well with solar panels and green roofs for gardening. Reusing old containers not only helps reduce a project's carbon footprint, but the modular nature of cargotecture—drop the containers anywhere with a crane—reduces construction time, too. And it's a new way we can feel good about. Given that these containers reach a point where they're retired from the shipping industry, their second lives as homes, offices, and retail space keep them from cluttering our already burgeoning landfills.